…balanced carefully atop the old, wooden chair. Her eyes twinkled with the delight as she looked out over the appreciative congregation. Next to her stood her father, singing a gospel favorite in his melodic, tenor voice. The six-year-old sang proudly beside her dad, the two voices harmonizing almost perfectly. These early memories of singing with her father represents the beginning of Linda McKechnie’s music-filled life. Even when she was six, little Linda’s dreams were being arranged by God-wonderful dreams of a Christian marriage, children of her own, and becoming a concert pianist and recording artist with her younger brother, Don. These dreams would guide and direct Linda’s entire life, but what she didn’t know was how long they would take to come true. Any success in reaching her dreams Linda attributes to her relationship with the One who formed them, her Lord and Savior Jesus Christ. Linda’s life verse is Proverbs 3:5-6, "Trust in the Lord with all your heart, and lean not on your own understanding; In all your ways acknowledge Him, and He shall direct your paths [NKJV]." Linda recalls the first time she truly "trusted the Lord." She says, "I remember when I was seven, kneeling by my bed and committing my life to the Lord. Even at that young age I realized I could not live without God’s help." 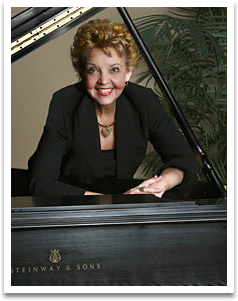 Knowing that her piano talent was a gift of God, Linda pursed her musical goal through high school and college, but her dreams of marriage and family would be the first to come true in her life. She met husband Dave on a blind date during college and later married the young seminary student. Soon after moving to Tulsa, Oklahoma, the McKechnie’s son Peter was born, and daughter Sheri Lin four years later. Linda quickly settled into a simple routine of changing diapers, midnight feedings…and surprisingly…loneliness, especially while Dave was busy with his ministry. Linda’s musical dreams were put on hold, causing her to go through a period of depression and introspection. She felt unimportant and insignificant as "merely" a mother and pastor’s wife. Linda could not see it then, but these events were all within God’s control. He was orchestrating her life for a later performance. When a nearby Children’s Medical Center needed someone to teach music to disabled kids, Linda had mixed emotions. Although she was excited, Linda was unsure of her ability to handle the physically and mentally challenged children. Linda began working with the kids and quickly found herself reveling in God’s blessings. Watching the children’s eyes light up at "making her own music," Linda praised God for His perfect timing. He showed her that she was making a vital difference in the children’s lives. Immediately she asked His forgiveness for her selfish thoughts, now counting the "insignificant" tasks of motherhood a privilege and a blessing. Linda’s first two dreams were nearly complete. However, almost 20 years had gone by. Her relationship with her brother, Don Marsh, had dwindled to a yearly phone call and a Christmas card. Family differences and misunderstandings had dimmed the hope of ever creating and recording music together. Then one day, the call came with the words, "I’m sorry Lin. Please forgive me…". Tears began to stream as Linda responded, "I understand. Please forgive me too." God had taught Linda another wonderful lesson, one of prayer, patience, hope…and reconciliation. Once more, God’s timing was perfect. Linda and brother Don began working together again. As producer and orchestrator for the Don Marsh Orchestra, Don began to collaborate with his talented sister-creating a whole new style of music. Soon the concert schedule started to fill up. By this time Peter and Sheri were nearing graduation from high school and college as they proudly watched their mother’s career blossom. After the family moved to Houston, Texas, Dave’s ministry expanded and an extensive staff was in place. Both he and the congregation encouraged Linda to pursue her new ministry. It wasn’t long before Linda McKechnie achieved her final dream…producing a record album with her beloved brother. 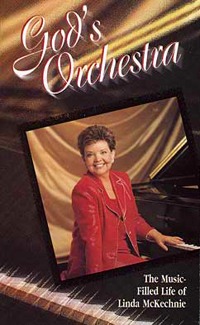 Linda signed her first recording contract with Brentwood Music at age 49. The result was the Hymnworks and Symphony of Praise instrumental charts. Six albums later Linda’s collection of instrumental recordings for Brentwood features her newest chart-topper, A World of Praise. Linda’s music is so stunning it is difficult to describe with words. Classical compositions are blended with moving hymns or favorite praise choruses, forming a sound that lifts listeners directly into the presence of the Almighty. Few selections stir the soul like Beethoven’s Fifth Symphony or Tchaikovsky’s 1812 Overture, but when a crisp piano playing How Great Thou Art or Because He Lives is woven in, you’ve got some truly magnificent music, filled with emotion and praise. Linda expresses her faith through her music. While other people may witness on street corners or from a pulpit, Linda simply steps to the piano and touches listeners with the majesty of God. Linda’s music has soothed crying babies, comforted stroke victims, and calmed nervous mothers in hospital delivery rooms. It has been choreographed for ballet dance troupes and dubbed into soundtracks for television. Many people have attributed healing of body, mind, and soul to God’s special touch through Linda’s gift. During her concerts, Linda often stops to encourage her listeners. "Don’t ever give up on your dreams," she says. "We’re all instruments in God’s orchestra. He gives each one of us the most marvelous gifts. All we need to do is discover them and then play our parts the best we can." She goes on to explain Proverbs 3:5-6. "Don’t lean on what you know. God is the Director of your life. Follow His leading, and don’t ever give up. You never know what God is doing. If he seems to be taking a long pause, perhaps that’s because He’s orchestrating something wonderful!" Perhaps believing in God and praying to Him are new ideas to you. Maybe you’ve never really opened up your life to Him or accepted His love and forgiveness. The truth is, God loves you and wants to help you in your life. He longs for you to turn to Him, to get to know Him, to experience the eternal peace, joy and life that only He can give. That’s why He became like us, human, in the person of Jesus Christ. He wanted to get close to us and understand the pain and suffering we go through. And no one understands pain and suffering like Jesus. In fact…He died understanding it. Don’t allow anyone to convince you that you cannot achieve your goals. Are you ready to come back to God? You can do so by simply telling Him, either through this prayer or one of your own. Dear God, I admit I need Your help. My life is empty in spite of all that I have. I am guilty of ignoring You and living my life without You. Please come into my life and make me the person You want me to be. I give You my life right now. I believe Your Son, Jesus, died to bring me back to You. Thank You God, for loving me that much. Amen.